These two chapters introduce a significant character and reintroduce us to one of my favorite characters in the book, Lady Pole (née Wintertowne). 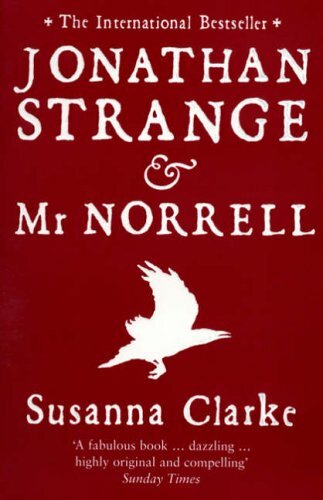 Norrell makes, well, not his first mistake, but perhaps his first truly disastrous one. 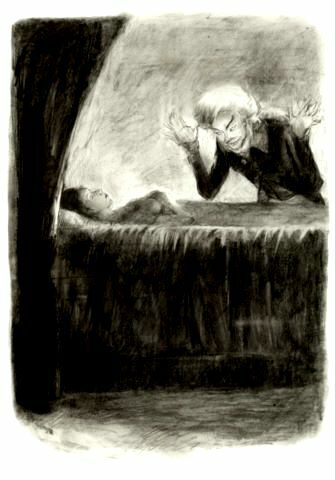 The association of a sort of mysterious absence with Miss Wintertowne continues when Mr. Norrell arrives at her deathbed, a motif that will continue throughout the book. I’m never quite certain if I find this motif to be more hilarious or more unsettling, but it certainly adds a Gothic flavor to all of our interactions with the young lady. Having finally persuaded Mr. Norrell to do some actual magic, Drawlight finds himself barred from the room where all the interesting things are happening. However, he and Lascelles both hang around insufferably (albeit humorously) awful. I always find myself reassured by their presence, much the way I feel about Mr. Collins when I reread Pride and Prejudice. Some characters just have an unholy knack for saying and doing absurdly terrible/stupid things, and I never get tired of reading about them. The gentleman with thistle-down hair. To raise a person from the dead is not the sort of magic Norrell would like to do. Indeed, it is not a human sort of magic at all, so he, reluctantly, and with reservations, summons a fairy to do his bidding. The gentleman that he summons wears a coat “of the brightest green imaginable,” an enormous amount of white hair, and a penchant for hard bargaining. This gentleman offers to help and aid Mr. Norrell in all things magical, but on the condition that Norrell credits him with the greater parts of all Norrell’s future achievements, and somehow I only just now realized that this stipulation is what Norrell finds off-putting enough to refuse the fairy’s offer. For all Mr. Norrell’s professed distaste for fairies and his tut-tutting about the dangers they present, I’m now quite certain that it’s not Norrell’s scruples, but his pride which makes a fairy servant so abhorrent to him. Thus refused, the gentleman asks Norrell where “the other one” is, meaning the other magician, Norrell’s “dearest friend,” with “red hair and a long nose” and “very conceited.” Norrell, of course, knows no other magician aside from himself, but this sets him to frantically considering all the men of his acquaintance who might fit this description. None do, so a bewildered Norrell instead turns back to bargaining with the fairy. Reasoning that fairies are not to be trusted, and so he must be very careful in his negotiations, Norrell requests that Miss Wintertowne be given another seventy-five years to live, half of which to be spent with the gentleman–“half a life is better than none,” after all. To seal the deal, the gentleman requires a token of the lady’s, and so Miss Wintertowne is miraculously returned to life–less only the little finger of her left hand. With her daughter returned, Mrs. Wintertowne is keen that the marriage to Sir Walter Pole should continue as planned. Sir Walter, for his part, barely knows what to do with his young bride, who seems not only returned to life, but returned to a kind of vigorous health and brightness that she’s never experienced before. Fortunately for Sir Walter, Miss Wintertowne is still amenable to the marriage, and she very shortly becomes Lady Pole. On the wedding day, however, the person everyone most wants to see is Mr. Norrell. Previous PostBook Review: A Court of Thorns and Roses by Sarah J. MaasNext PostSupergirl looks surprisingly good?